Clip in and take the leap. But the thrill of zip lining does come with some risk. In the last year, accidents in Tennessee, South Carolina and at least a half-dozen in our area according to government reports. But don’t jump to the conclusion the government is keeping track. 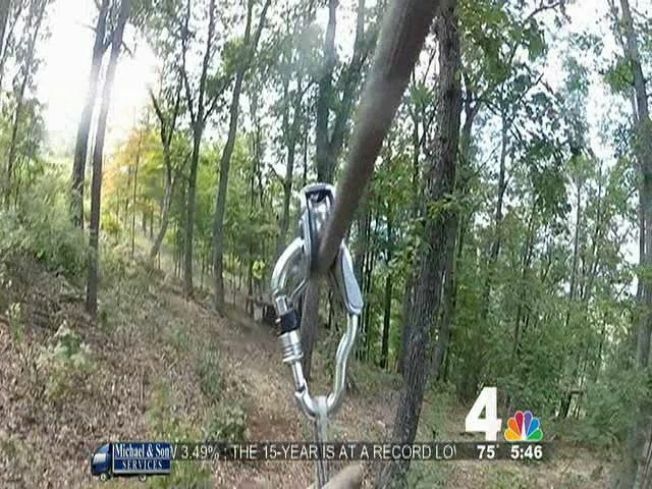 Unlike amusement parks, white water rafting or other adventure sports with heavy government oversight, the News4 I-Team discovered zip line companies are mostly self-regulated. We visited four popular zip line attractions in the D.C. area and found standards vary from state to state. At River Riders in Harpers Ferry, W.Va., we get a safety briefing, a full body harness, two zip line clips and a helmet. One of our three guides tells us during the safety briefing, “I ask that you leave all the unclipping and clipping only to the guides." At Terrapin Adventures in Savage, Md., there’s no safety briefing and one clip for this single zip. But one of the two guides is quick to remind a guest down below, "I need your helmet on down there! Helmet on! Helmet on!" "We're looking to educate the entire industry,” says James Borishade. He’s the Executive Director for the Association for Challenge Course Technology, often referred to as ACCT. The trade group sets “minimum standards” for zip line companies when it comes to construction. "The equipment should be inspected daily,” Borishade explains. “Then monthly. A more thorough inspection. And then annually it should be inspected by a third party." All of the zip line companies we visited except Bryce Resort say they follow ACCT standards. Matt Knott owns River Riders and says, “The majority of the standards have to deal with the building of the course, the design of the zip line. But there is no standard that says you have to have two trolleys, full body harness and there's no standard that says you have to have a helmet." Knott says he opted to include these more expensive safety features at the recommendation of the company who built his zip line course. In spite of the extra purchases, Knott says this summer “we did have a couple of guests collide on a cable when they were coming onto the platform." Knott was required under a new West Virginia law to report the injuries. He says he welcomes the new regulations toughening standards for reporting injuries, staff training and inspections. He thinks states like Maryland and Virginia should follow his state’s example. Schwartz says he’s looking into a guide wire system to keep people tethered to the zip line the entire time. Terrapin Adventure’s owner Matt Baker says his company inspects twice a year, more than the ACCT recommendations, and his staff is always available to instruct guests. Baker says his staff does all of the clipping and unclipping on platforms. Bahman Azarm is the president of Outdoor Ventures, which designed and built The Adventure Park at Sandy Spring, says the park purposefully doesn’t use helmets because they provide a false sense of security and would likely not prevent injuries associated with zip lines. Click here to see a detailed description of each company’s injury record, inspection procedures and safety precautions. The last set of ACCT safety standards were released in 2008. Borishade says due to the rapid growth of the zip line industry and improving technologies, ACCT will be releasing a new set of safety recommendations in the next month. “When you look at the numbers” of zip line riders “versus incidents,” Borishade says, “we see that there’s a low incident rate. So, we do believe the industry is working well.